I tried to lower my 4th gen more today but I ran to a bit of trouble breaking the bolts loose that hold my adjusters on my sleeves tight. the head of the bolt was too far inside the hole to use my allen socket set so I had to use individual allen wrenches. I got two broken loose but I'm stuck on the two passenger side ones. I'm pretty sure I finished stripping the rear one but the front one should still be decent. Is there any other way of getting these loose besides taking my dremel and cutting the screw in half or cutting the bottom of the sleeve to lower the whole thing? is that screw necessary? 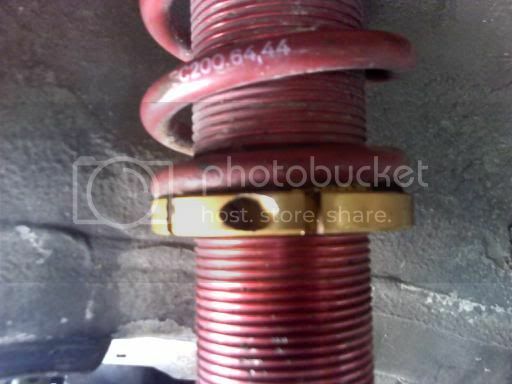 I miss my ebay springs that used two adjusters to lock into place instead of a stupid bolt design. any suggested appreciated. Left-hand drill bits do wonders at extracting crap screws and bolts. hit it with some wd40 and get a flat head and a hammer and try to jam the flat head in there then twist. it happened to me a few times so i replaced the allen screw afterwards. *note* this technique is ghetto, and it dont look pretty so dont blame me. If you use a torch on the outside ring, it will cause it to expand enough to possibly free it up. If you use a torch on the threaded sleeve, you just bind it up harder. However, if you torch the whole thing and quench the sh*t out of the threads while it's still hot, it usually breaks free pretty easy. One of the mechanics where I work showed me a neat trick a couple years back. He took a torch and heated the sh*t out of the nut he was trying to break. While it was still cherry red he took a candle (like dinner table kind of candle) and quenched the threads with it. Broke free like nothing. However, I wouldn't recommend a torch anywhere near the strut, seeing as it is thin wall steel, full of oil and then pressurized to boot.